St Catherine de Ricci O.P. Alexandra de Ricci was born into a noble family in Prato, near Florence. While still quite young she lost her mother and, from that day, she took Our Lady to be her mother. As a child she held familiar conversations with her guardian angel who taught her to pray the rosary. She was educated in a monastery where her aunt was abbess. Wanting to enter religious life Alexandra met with great opposition from her father. Allowed to visit with the Dominican Sisters in Prato she begged to remain there. But her father took her away, promising her that he would let her return. He did not keep this promise and Alexandra fell ill. There was great worry for her life. Frightened into agreement, Alexandra’s father gave his consent. Soon she entered the Convent of St. Vincent. In May,1535 she received the Dominican Habit from her uncle who was Confessor to the Convent and given the name Catherine. She was very happy to receive the name Catherine and strive to immigrate her patroness, Catherine of Siena. Catherine often had visions which made her fellow Sisters wonder about her suitability to their way of life. She was at the point of being sent home when she became aware of the situation and told her confessor. He insisted that she tell her Superiors of the heavenly favours that she had received. Catherine was twenty years old when she began the weekly ecstasies of the Passion of Our Lord which lasted for twelve years. She received the Sacred Stigmata which remained with her always. Catherine became prioress of the Convent and all was managed well under her hands. 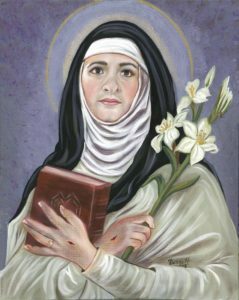 She was noted as a kind and considerate superior, especially devoted to the sick and troubled people who would visit the Convent. After her death in 1589, many miracles were performed at her tomb. She is often depicted in the Dominican nun’s habit with the instruments of the Passion.